From the Warp: Would you pay to play 40k? Would you pay to play 40k? I happened to be out the other day and stopped by a gaming store in my greater area, not one I've ever played at, but one I heard charges players to use the gaming tables for 40k. So I figured what better to do than to stop by and see how this works for myself. Want to play 40k for the day? It will cost you $2. It doesn't matter how many games you play or how long or if you even get a chance to play apparently, just hold onto your receipt and you can "play" as much as you please during the day. Want to buy a month pass? It will cost you $18. I guess you can play all month then. If you buy $20 worth of merchandise, you get one pass for a single day of gaming. Buy $40 and get two passes and so on. I believe they even charge people to watch games but I don't have much information on that aspect. I can honestly say I've never heard of this before, I can't think of any other store out there that does this, but the guy behind the counter assured me lots of other places have been doing it for a while now. Uh, ok then. I asked about this "fee" scaring away players and while I didn't exactly get a straight answer, I don't think it's affected the store's core gaming group... that much. From what the store clerk told me, they had a higher than average number of observers and young kids that would come in all day and play and hang out and this was a way of discouraging those gamers in particular. And then I started thinking, there are other places that do something similar... bowling, darts, pool tables. You have to pay to use them. But they provide everything you need too. They provide all the extras so to say and if they're doing it right, those extras are really nice too. Well maintained equipment, comfortable environment, good services, etc. Maybe there's something to this I started to wonder. And I thought about what "makes" a game of 40k outside of the players with their armies. Sure it's the store and the environment, but it's really the table with all the terrain that sets the stage. I wonder how much terrain is at the "paying" players disposal at this store that charges players. Is it more than usual? Are all the tables well maintained with a variety of unique stuff used to create great, themed battlescapes? Looking at what was in the store when I stopped by, I'm guessing no and that would be my issue with this whole "pay for play" idea. If you're going to charge me to use the tables, what am I getting for my money? Are you just going to throw a green painted table at me with some aquarium pieces on it or do I get to play on the kind of battlefields you see in White Dwarf? The tables the Forge World guys create, you know... the tables that can tell a whole story without any miniatures on them. That's what I want if I'm going to have to pay for the chance to play 40k at your hobby store. So now I'm curious, does anyone else have to "pay to play?" Would anyone else pay to play? I know the stores you're talking about as I game at the Woodbridge one every Saturday. The one in Woodbridge doesn't charge you for just observing but they don't provide any terrain either, just the table to play at. It's kinda a rip and I don't know of any other place that does it but hey beets spending 20 bucks in gas to get to the next nearest place. I would pay to play if there were plenty of room, tables and terrain at the ready. I dont think I would have to have terrain from Forge world or anything - yet something several steps above aquarium terrain for certain. $2 per day or $20 per month isnt so bad - as rarely as I game it would be worth it to spend a few bucks to game in a nice atmosphere on a good table. If they spent the money on terrain or on Building a case to display great armies that would encourage people to buy into their hobby, then I could see it. Just charging people AND not providing terrain is a bunch od bull. How can you EVER expect a new player to get into the hobby when they have to confront the price of the minis, but also purchasing terrain. If my FLGS did this, I would open the garage to everyone instead of just my little group of glue sniffing crash test dummies (meant in an endearing way). I've been charged to go to tournaments, but never have I been charged to play at a store. Quite the opposite. My local guys at Kingdom Wargames seem to have made the store for the pure purpose of playing games... they have very little merchandise and most of it is shoved onto a couple of small shelves in the back. The majority of the place is gaming tables, hobby stations, and even a lounge with couches, a HD plasma, and a xbox 360. I can't even fathom why one would go to a store and pay to play on their table, unless it is of Forgeworld Quality as you stated before. I routinely pay to play. The gaming club I attend meets at a local elementary school every week, as the guy who runs it is a teacher there. He provides all of the tables and terrain, as well as a consolidated place for everyone to play for $2. If you don't play, you don't pay, and it's all on the honor system. All of the proceeds go to his class to pay for field trips. I have had to do this at a battle bunker, but when stores try I refuse. In all honesty they get stippens of terran for free if they ask GW, and I am funding their store so nope not willing to pay. I'm far from rich, but $2 is close enough to $0 for me to not care about it at all. If the game store needs a few bucks to cover some expense, maybe cleaning up after messy gamers, so be it. One of our local idiots started doing that. No one plays there now. Everyone's moved on to better locations now that a few have sprung up. I think pay to play is something that all game stores need to look into. With the competition for the gamer's dollar going more and more to online retailers the local stores are getting squeezed. The fact is there are lots of people that never spend a dime in a store but expect to be able to use the store whenever they want. This is unrealistic. I think stores should charge for table space and for terrain rental. 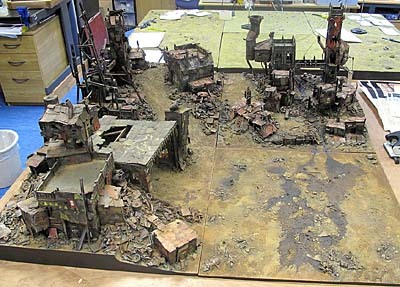 The terrain rental would encourage gamers to actually buy some of those cool terrain kits and build their own collection, even if they are playing at a store. As gamers we need these stores to stay in business and this is one way that would help them do that. I would charge players in terrain. Bring in a terrain piece, game for 2 months. Fix a terrain piece, game for a month. Heck I would offer more time for a really nice piece of terrain, or more time if you build something from a list of needed terrain. The idea is to get tons of terrain, and vest your players in the tables and terrain itself, that way it should get taken care of a little better. I've actually seen this in a few places, and frankly the quality of the tables was enough to justify the "membership fee" so to speak, which about 10 years ago was about $20 if my memory serves me. Would I pay to play 40K? Don't we already? I'm not a person who likes playing at stores or tournaments - I have never found that a good environment for my games, and I can't imagine the quality of that envrionment changing based on a fee. I'd rather reserve the space and pay for the table materials and time myself, although not everyone has the space they can set aside to do this. Perhaps it won't be as good quality table as it were, but it will definately be my prefered environment. Not quite the same, but I did pay-to-play at a LGS. Before I moved the LGS had a very active 40k scene where tables were at a premium. Eventually the 40k night got flooded by high school kids who bought their armies on line. A few of us formed a club which rented out the tables on a separate night. The deal with the LGS was pretty straight forward, anyone could join at $10 a month and all of the money went straight back to the store. The dues funded new terrain for the store and high value tournament prizes for the club. This approach had the end effect of solving several problems at once; First instead of waiting around for tables with enforced time limits, everyone got to play on which ever night they showed up. Also the tables got considerably nicer and a regular tournament schedule also started. When I first moved to Maryland, the Battle Bunker here charged a fee to play. Seeing as I was new to the area, and didnt know anyone else to game with, I was somewhat over the barrel there. Luckily, it was the Bunker, so terrain and decent players were in ready supply. Not too long after, they dropped the pay-to-play, and as far as I know, have not gone back to it. Drunken Samurai makes an excellent point. I've watched two stores in my home town fold up, each had that exact problem. Most would never buy anything, but game there consistently with all their eBay winnings. I would gladly pay $2 to use a nice table with nice terrain, no time restrictions. The key word there being 'nice' of course. When I play in a store I usually try to purchase something as well, even if it's just a couple pots of paint or a new tube of plastic glue. I don't think I would mind paying a couple of dollars to play on decent tables at a local shop. Our club lost our store, and all the other in the area aren't friendly to our ethos. So out club rented a space and operates on a invite only $5 to play deal. It covers the rent and that's about it. Frankly, I think its a fine thing, especially if it'll keep local stores in business and if it would keep parents from using a store as a babysitter. The main hobby shop I play at does not currently charge to play. If they would, I would gladly pay. The store is moderate size but with all the other hobbies going on, it's nothing to stop in and see Warhammer 40K or Fantasy battles going on, not to mention Blood Bowl league games, Flames of War, or other games. That being said, there is only so much space to be had on any given night. The back room of the store is mainly filled by card-gamers on most evenings. They do have an enclosed semi-sound proof room they do rent out for RPGs, but the fee is modest. This economy today is rough. Stores that managed to survive now have to get creative to compete. Like Samurai had said, e-bay and such haven't helped store owners at all. Most of us have a creedo amongst us, "We pay where we play", meaning, that's where we buy our stuff. So, if my friend, the local hobby store owner said he had to charge us $2.00 to play, I would gladly pay it. He has lots of amazing terrain for use. Sometimes they get broken, and need to be replaced. He runs tournaments often and when he does, the prize support is pretty nice. I've seen too many times the folks come in (especially the younger crowd, with less coin to spend), and they just assume they are going to play, use tables and scenerey and not spend a dime. To support my local shop owner, I leave with buying something, even if it's just a copy of White Dwarf. The bottom line is that without support, less stores will continue to exist. I already travel 45 min to play there, because anything else local is poor in comparison as to what is available at my friend's shop. I'm in a similar situation to a few around here, our local store basically stopped supporting the hobby, and eventually consolidated and removed tables altogether. A few of us have spearheaded the creation of a local miniature's gaming club that meets bi-weekly at the local College. We don't charge much for a year membership, 15 bucks, but we supplement it by bringing a cooler full of pop and sell cold cans for a $1. It definitely helps bolster the funds and would suggest it for any other clubs out there. As far as paying to play at a store, I'd expect something more than a sheet of plywood with terrain on it. I'd expect the board to have some detail and hopefully a theme. I guess I take the same approach to this as I take to taxes. I don't mind paying taxes at all, even high taxes, IF I get value for money. I want great health care, awesome roads, police and firemen. I don't want wars and corruption. What I would like is a two sectioned store. One with the loot and one or two decent tables, and another with lots of tables, awesome terrain (encourage people to build and leave at the store), snacks, pop, and a modest members fee. Then it becomes like a club and you get value for money. Win win. I think that stores need to be like a club in many ways. Heck yes I would pay. I think there's just a mental commitment to gaming when you pay. Some of the best "friendly" games I've had have been in the realm of pay-to-play tournaments. The chaff-players are blown away by the entry fee. Overhere in Switzerland I have never seen a store that would charge you to play and I guess that would be extremely unpopular as we already pay high prices for the products. Ebay is not that much of a problem as players still buy tons of miniatures in the stores. Our local gaming groups are renting rooms on their own, however, and in this case you have to pay either 10 bucks per game/day as a non-member or around 60 bucks per month as a member. I normally wouldn't pay to play. Me and all my friends are more "veteran" warhammer enthusiests. We all have tables and terrain at our houses. At the game store I would expect to play for free in exchange I would purchase things from that store if the prices weren't totally unreasonable. However like you said. If the store provided a table that was increadable in itself I would line up to pay at 2 dollars a day easy. But it had better be a table like the one pictured above. The only times I've been charged to play was when I was out of town visiting friends. Their local game stores charged $5 to play for the day. It seemed odd to me but whoever I was with always covered the charge so I never questioned it. The places were not spectacular places to game and there were stores fifteen minutes down the road that didn't charge so I didn't see any other gamers besides my friend. When my local game store was closing down and we found out the nearest store charged to play we talked to the owner, he had a "Going out of Business" sale where he sold off most of the tables and terrain to the regulars at the store real cheap. Its reminiscent of a gaming club to me. Lots of places have bands of gamers who gather together and hire say, a church hall, to play. these people each pay "subs" of a quid or two to cover the hall and then they set up tables and play. It's quite common in the uk. But I've never seen a GW store or FLGS with the same ideas. I pay every week to play at my local club, which costs £3 per week. The cost covers the room hire, table purchases and maintenance, terrain purchasing and subsidises some drinks and chocolate. I've never heard of any game stores in the UK charging to play though. I wouldn't mind paying a modest nominal fee to play. I already pay for local club participation and national tournaments which covers table construction and so forth. And if it means that opponents want to play and be there, all the better. That particular store has had large number of card game players and "observers". Because of the collector/ random distribution nature of card games, there are extreme incentives to buying in bulk at discounts. Other than Launch Day events, few people buy cards at the store (those few people buy many cases however). So I can see where the need for this comes from. My only real gripe with the system is that is feels a bit like Purchasing Rights for Tickets. You are effectively buying right to compete for table, you are not getting a table plunking your $2 down. Luckily, the pool of players is low enough anyone seriously looking for a game on a weekend, just gets there before 1 or 2 pm, and gives their $2 and grabs the table for the day. if we actually had a constant demand for table space that exceeded capacity it would bother me more. Over all, I spend so much there I have 2 months of free tickets, so I just roll with it and wish I had remembered to keep my Malifaux minis int eh card when I spot by on Saturdays. Sadly, the store doesn't even carry Malifaux. I've been suggesting this for years. After all your LGS is a business not a clubhouse. When I play at a LGS, I often feel compelled to purchase something in order to support the store, with a fee for playing I would just pay that instead of buying models I dont need. The store where I play has toyed with the idea and ended up not sticking with it. The system now is that if you buy your stuff there (or just be a regular customer of anything they sale), then no one cares. For leagues and stuff, there's usually an enterance fee that is paid back to the winners at around 80% (as store credit). If they did switch to a pay-to-play system, I'd probably be gone. There's other stores that are not much further that I like just as much. At my local store, there's a 3 dollar fee which covers up to 3 games. The difference is that the store tracks your win/loss record, and awards 'points' for wins, and less 'points' for losses. Once you get to a certain point total, you get $30 in free GW merchandise. It basically works out that if you play for 3 days, and play 3 games on each day, and win them all, you come out a little ahead. Its a powerful incentive, but of course the store comes out pretty far ahead at the end. I think I have an idea what store you are talking about and as Bryce has said you do have a large number of card players that really don’t do much other than play the cards that they have from the last expansion. Also they have a large number of people that come in and play other games that requires them to bring in their own terrain to play it, they just need a big space to play the game. I don’t mind paying the $2 for a day’s worth of gaming, and I don’t mind bringing in my own terrain I think it is a small price to pay to help keep the LGS open in today’s economy. Would it be nice to have tables at another venue we could go to? Sure, but then how do you promote your hobby if you are hidden away somewhere where you are only invited by personal invite? This hobby is not about hiding ourselves from others it is about finding others that like to play/hobby the same as we do and we need places like the LGS to do that. Steve P.
I've always felt obligated to "buy something from the store" where I play to help justify them losing valuable merchandise floor space to cater to my hobby. I would actually prefer a $1 or $2 "fee" that would then free me of this sense of obligation (Since I can probably get a better deal online etc.). However, stores should make a bit of an effort to provide something better than what a person can get at home or a friend's house (by way of tables, terrain, a "league" or what have you). In a private setting I'd likely have to alter my play schedule to mesh with their store hours rather than just play whenever, dress/drink/act however, put on whatever music. So after all, if it's not in some way better than what you can get in a private setting (i.e. "at home")... why should I play there at all (regardless of if it's free or fee)? Terrain can be obtained from GW fairly inexpensively by a store and they can always "pay" special customers in store credit to have it painted - constructing tables can be expensed - shelving can be expensed to store the terrain - so there's no reason why a store shouldn't "blow away" a home setting... many of the advantages are on its side. For these advantages, I have no problem paying a small fee ($2). My initial reaction is no way I would pay, but when I think about it a store that offers up gaming space is giving up retail display space. With that in mind a small fee if the store provides a quality space with terrain is not unreasonable. Another perspective though, my FLGS has a massive amount of play space pre-terrained tables, lounge and painting areas. It is a fantastic store. The owners go out of their way to make things comfortable and offers discounts to people making large orders. This excellent treatment of their customers has provided record profits for 3 years running. So depends on many factors. Can the store afford the play space verses retail space? Do the playing / paying customers make up for the lost retail space with increased purchases? I my FLGS required 2$ a day I would pay for it because what they offer is worth it. If it was a no frills space I could recreate in my own garage I wouldn't pay. This is the first I've heard of pay-to-play at a gaming store. At first I was appalled. The store may be catering to your hobby, but then when new customers come in to the store, a game in progress is essentially free advertising for them. I do understand the obligation to buy something that some people feel when going into a store and using their tables to game. I think a good solution could be that the $2 (or whatever) fee is used for store credit. I think it is a must, with all the internet buying and trading going on. If I would run a store, I most def would charge! You wouldnt have to if you could expect people to buy from you instead of the internet. When people buy things online and take it to the store that has to pay rent, what should happen? Excellent post! And yes I do want to open my own game store! In my area, retail space for 10 tables would be about $1500 per month. $50 a day at $2 a person, just to break even? Not including electricity, heating/air and all that other stuff? Not to mention your demands for excellent environment and superior tables? $2 is not too much to ask. I guess you could say I pay to play at our store. But we don't pay for table use. All us will kick in every now and then for new terrain and tables (Not just 40k we get FOW player to kick in too since we share). So really us the players are the ones who own the tables and terrain and the store just gives a place to use them. We had a business model to pay to play at $5 per table per day. This would get the table for the whole day for both players and one soda for each person. If you wanted to play after our normal store hours up till midnight u can pay an extra $5. We would provide the terrain that we made and from GW. Hell, you could even rent out one of our in-store armies for the day costing around $10 to $15. The reasoning is that it keeps down on the kids who come in and just take up space on tables but don't actually buy anything and allowing people who do to be able to play. The other reason is that we want to give the customer a comfortable place to go and enjoy the game but that cost money to run the AC/heat. In the end tho, the place we got is not that good in the cooling or heating so we couldn't justify the cost in doing the pay fee. As long as the fee is fair and there isn't any free play competion around, a store could do this and make it work out well. Being a local to Ron I do play at the stores he mentioned. I think this store has a trade off going. While they do not provide terrain and will not store others terrain on site, they are by far the biggest and best stores in the area. Both have 4 5x10 gaming tables and a plethora of wood card tables and chairs that can be used for a plethora of different games. Both stores also have a sound proof roleplaying room. While I wish we could store our terrain there and I spend enough money at the store to never not have enough free day cards to need to pay to play their I have to admit that Since I have been attending their store for years, suddenly having to pay to play is no fun, but agree it is a necessary evil. You're talking about my FLGS. They do it specifically in hopes of helping make ends meet, and in an effort to get the folks (of which there are many) who spend a lot of time, but not money, to stop being complete moochers. From what I understand, it doesn't affect the 40K/mini gamers very much at all; it does have a huge impact on the tabletop and CCG gamers, though, who sit at the store's tables, plug their laptops into the store's plugs, etc, while buying all their product online. Most mini gamers spend enough at the store that they never really worry about paying fees. With miniature gamers, honestly, chances are I'm going to drop a few bucks on at least some paint when I go in. Now, you tell me that I've got to pay, and there are a couple other places that would let me do it for free (so long as it wasn't one of those rare days where they had posted that they'd need the space, like Black Friday) and I'm going elsewhere. I can understand other hobbies might work with a pay-to-play, but 40k? If I'm PAYING to play at your store AND buying my product there, you had better give me something SWEET for paying more than the few hundred bucks I dropped on an army there. No F---ing way would i pay to play. I live in the Detroit area. I have 5-6 stores within 1-20 miles. If one in this area started to charge to play they would qickly go out of Buisiness. Gamers tend to be loyal, IE they buy their product were they play. Also throw in pop machine and snack machine. plenty of money so you dont have to charge people to play.This just seems like a good way to tick off players and have them look for a new stomping ground. My local Group is 15 - 20 guys all the time. With a flux of upto 35 players. Big hit if we pick up and go to your competitors store. NO WAY WOULD ANY OF US PAY TO PLAY!!! I'm shocked at some of the negative attitude towards paying 2 bucks to play 40k all day, but not surprised it is anonymous. I would be happy to pay 2 bucks to play. Why would you not pay to play? Support your store! You are taking up space in his store for several hours, and probably not buying any thing, least you can do is throw him 2 bones. I happily throw 5 bucks into the donation box every time it is passed out at our club. Someone has to cover the cost of power and space! Now, I have to say that I would hope these fees are going right back into the gaming. Tables cost money to build and maintain. In case you have no idea, the materials to make a decent table can cost well over 100 bucks. I know because I just bought all the stuff to make my own yesterday... Plus you have to make or buy terrain. Then woops... some one drops and breaks a terrain piece... or breaks the corner off a table... it costs money to repair and upkeep every thing that we all take for granted. Why should that come out of the owners pocket? What about the square footage those tables are taking up. That costs money too. Owners pay their rent by the square foot and letting you game in that space is making no return for his money. In other words, those tables are costing him money to have on the floor just by being there. If the owner of the comic store I sometimes play at asked for cash, I would happily cough it up every time. He is a great guy and we all have a good relationship with him. I would definitely not go running off to some other place out of spite. The one closer to home no longer has any games played there, but they would host one of the local guilds, and members were to pay $2 per GAME (yes GAME, not day) - so when the touney called for 4 500 pt games, thats $8 for that, thankyou. The terrain and boards were reasonable - I wouldnt call them brilliant. Oh and if you werent a member it was $5. Closer to work is much better - no charge if you just come for a game, the terrain is good and the boards are many and quite reasonable. Hell they even have store copies of other games that Ive played with the staff there, though Im now a bit of a regular. For thier half yearly tourney there is a charge (or a cheaper charge + terrain donation) but its pretty reasonable - it pays for prizes at the end of the tourney aswell. I paid $25 (no terrain) it went for a good 4-5 months, and I got an $18 prize out of it - I didnt even do that well! the price with terrain donation is $15 so Its more than reasonable. Donating in church. Donating is big in these circles, it's a way of life. Someone going to church every Sunday like clockwork will (for various reasons, let's not get into that) shell out for whatever the church needs. It's a way of life. If you bring someone in from the outside, someone who doesn't live around those parts and maybe isn't that convinced, that someone will be much less likely to give then. So why can't culture be a part of gaming? I don't think either side here is wrong at all. It's a question of immersion, means (some buy off the Internet/eBay simply to afford it at all, others because they are cheap), personality, and culture. I never donated to the store I used to frequent. I did buy a lot of merchendize there (they had awesome prices and also an online business, but buying in the store was cheaper effectively and if I asked for something they ordered it for the next weekely shipment) and stuff like pop (so what if I could get it cheaper). So after this mass of slightly random information, Jawa (etc), don't be surprise that people seem put off by fees. I think that it whatever works is good and if you have great staff and great service things can work out. Having a donation box is a good idea. A pay with terrain tourney is another great idea. Teaming up with people who do commissions is another great idea (if you haven't this is a great idea Jawa. And you can often get a deal with the store that way. I.e. Buy there and then you paint them for a fee). The more I think about it I think that fees put off people and donations/merchantdise is a better idea. And being a good role model by actions is imperative, especially to younger people. I can see a smaller mom and pop place charging to play. Discouraging loiterers is one good reason. As for the price, it would depend on what so many people have already stated - the quality of the table/terrain, the atmosphere, etc. But I'm also a firm believer that there are gamers out there that are willing to pay a couple of bucks to play in a location that is free from a lot of the elements that take away from the hobby. I think its a great concept. Unless the store is truthfully using the money to offset gaming space utility and equipment maintenance costs, then charging seems a bit counter productive. My local store doesn't charge, but I still prefer playing at a local dedicated wargaming club ($10 annual) because they have space, atmosphere and an ever increasing collection of boards and terrain.